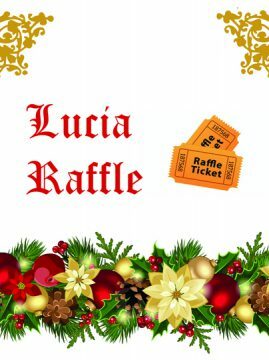 Welcome to donate prizes for the Swedish Chamber of Commerce Lucia Raffle for the benefit of War Child one of our member organizations and who is now also active in Sweden This year at the highly popular Swedish Chamber of Commerce Lucia Dinner and Dance on December 10, 2016 at Hotels van Oranje the Chamber will arrange a Lucia raffle for all the guests attending and all earnings will go to War Child to be used in their important work to support children affected by conflicts to get the chance to rebuild their lives. As one of the most popular and well-known charities in The Netherlands, War Child is now coming to Sweden.With the ever-growing need for support for children affected by conflict and the potential for a new, young and inspiring non-profit organization in Sweden, the Insamlingsstiftelsen War Child Sweden has been established. In the short period that War Child has been targeting Sweden, it has made many friends and already build a strong network. The organization was humbled to receive grants from among others H.M. Queen Silvia’s Foundation ´Care about the Children´ and Postkodlotteriets Kultur Stiftelse. With this support, War Child can offer psycho−social support, child protection and education, supporting children to find the strength to rebuild their lives. Furthermore, it enables War Child to raise awareness for the situation of children affected by conflict and advocate for their rights. Welcome to donate to the Swedish Chamber of Commerce Lucia raffle 2016 today and do not only receive great marketing for your brand but also make a very appreciated contribution toward helping children in need! To donate with a gift to the raffle, get in touch with Josefin Wallberg, events@swedishchamber.nl or phone 020 320 32 26. This gives our Members a perfect opportunity to showcase their products and services in a creative way on our website and social media and for all the attending guests at the Dinner itself. All donations are greatly appreciated and all contributors will also be mentioned in the programme on the night. Prices we are thinking of can range from dinners at high end restaurants, champagne, wine, office fruit arrangement, Swedish products and books to the latest tech. We also welcome cash donations, with which we will purchase a prize, or combine with other cash donations to create larger gifts to be won. 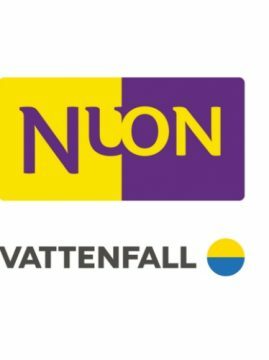 Finally, it is also possible to make a donation directly to War Child Nederland at the account number below and mention “Lucia Dinner” and the donation can be added up to the income from the Raffle from the Swedish Chamber of Commerce. IBAN Number War Child Holland: IBAN: NL56RABO0166366366 and please write “Lucia Dinner” in the description. 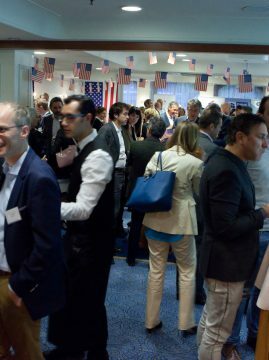 The Swedish Chamber of Commerce would like to thank all organization partners and guests for contributing to a successful American Breakfast event on November 9, 2016. A special thank to Mr. Michiel Bicker Caarten for guiding us through the election news during the morning, to Mr. Marcel Baartman, Clingendael for his economical analyze. We would also like to thank AmsterdamInBusiness and Hotel American for supporting this joint European Chamber's and Business clubs event. On November 4, 2016 The Ambassador of Sweden Mr. Per Holmström held an exclusive luncheon at the Swedish residence to personally thank Mikael Sørensen for the very pleasent co-operation and for his personal committement towards Team Sweden and the Swedish Chamber of Commerce during his time as CEO at Handelsbanken in the Netherlands. At the same time it has been very exiting to follow the fantastic growth of Handelsbanken in the Netherlands during those years. Mikael Sørensen has now been appointed CEO at Handelsbanken UK and will therefor be moving to London. 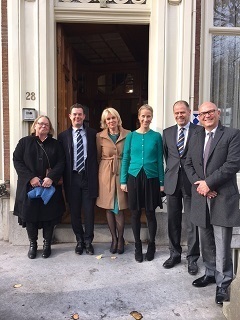 The Swedish Chamber of Commerce wish Mikael Sørensen lots of success with his new asignment and we are very happy to introduce him to Ulla Nilsson and her Chamber colleagues in London. 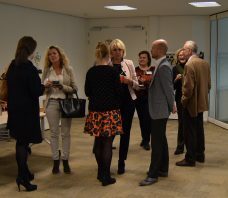 The Swedish Chamber of Commerce would liket to thank all members and guests for attending the Swedish Chamber of Commerce Company Visit to Elekta in Veenendaal to learn more about Elekta Brachytherapy presented by Maarten ter Mors and his colleagues. We would like to thank Maarten ter Mors and Thjis van Bommel for initiating this very interesting company presentation and Esther van Voorst for the welcoming hosting to their beautiful premises in Veenendaal. Thank you very much Lund European Business Tour 2016 for visiting the Swedish Chamber of Commerce. We were very pleased to feauture presentations by Justyna Krajewska, Amsterdam InBusiness and David Haqvinsson, Handelsbanken together with an introduction to the Swedish Chamber of Commerce in the Netherlands. We wish you a successful continued tour in London! PERSBERICHT Jens Wiklund nieuwe CEO Handelsbanken Nederland Amsterdam, 11 oktober 2016 – Handelsbanken heeft Jens Wiklund (41) benoemd als nieuwe CEO van Handelsbanken in Nederland. Hij is de opvolger van Mikael Sørensen die is benoemd als CEO van Handelsbanken in het Verenigd Koninkrijk. Jens Wiklund heeft de Finse nationaliteit en bekleedt momenteel de functie van Chief Financial Officer bij Handelsbanken UK. Hij beschikt over ruime internationale ervaring binnen Handelsbanken. 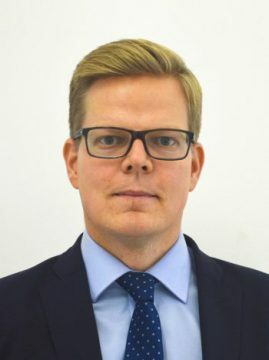 Voorheen was hij onder andere Head of Finance/Senior Vice President van Handelsbanken Capital Markets, Head of Administration, Accounting & Control/Senior Vice President van Handelsbanken International en General Manager van ZAO Svenska Handelsbanken in Rusland. De benoeming van Jens Wiklund is onderhevig aan goedkeuring van de toezichthouder.